On Sunday we had a little tea party for Tyler Lee, his actual birthday being on Monday the 16th of course but we had our own plans for that day so decided that the Sunday would be the perfect day to celebrate with family and friends. My boy is obsessed with In the Night Garden, he doesn't get to watch it much now as he's begun going to bed earlier again but he loves all the characters, especially Upsy Daisy who he calls Daisy and he always has to have her by his side, so I thought an In the Night Garden themed tea party would be lots of fun for him. 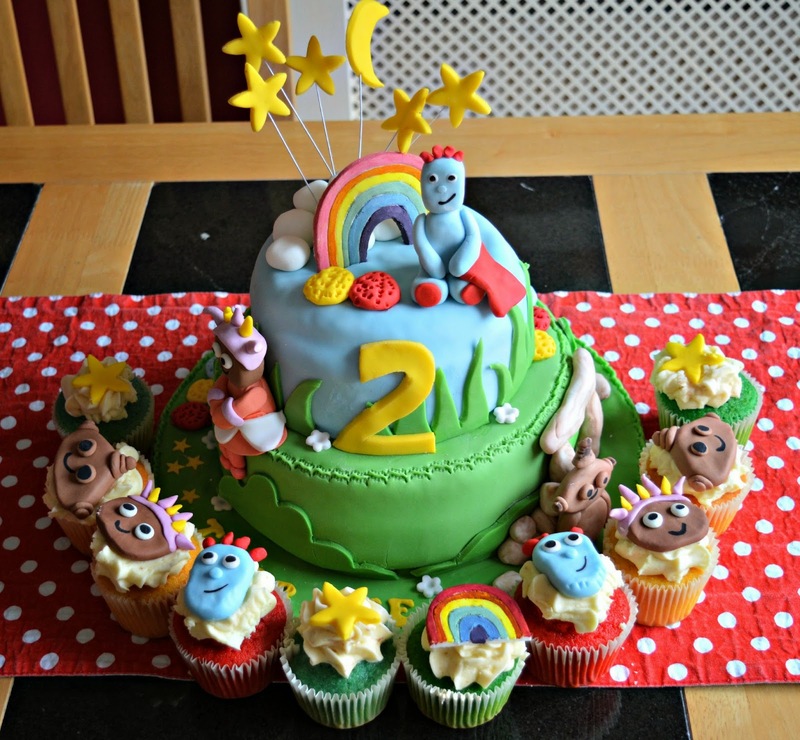 Jacek and I saw a picture of a two-tier In the Night Garden cake on Google images and fell in love with it, we asked the cake maker to copy that cake but to also add in elements such as the rainbow up by Iggle Piggle. I also asked that the inside of the cake be rainbow sponge to match the rainbow on the cake and cupcake. We also ordered 10 cupcakes with the characters faces, stars and a rainbow - the children loved eating these. Tyler Lee was so overwhelmed when he saw his cake for the first time that he cried, he was so happy! He especially loved Upsy Daisy sitting on the side of the cake and the Upsy Daisy faces on the cupcakes. Before deciding on the In the Night Garden theme my mam also got this little penguin cake. The inside had chocolate biscuit cake and it was covered with icing for the penguin and lots of edible glitter. It was quite fitting actually as one of the gifts we got Tyler Lee was a book about a penguin. I wanted everything to be as colourful as it could possibly be, I think a child's birthday party should always be cheerful so I picked sweets and treats with colourful wrapping, jellies full of colour and used colourful straws for the clear bottles. I used some of Tyler Lee's In the Night Garden toys to decorate the table. I also used an old Easter bucket to hold some chocolate and marshmallows, I stuck an Upsy Daisy sticker on the front to keep with the theme. I got the stickers from an In the Night Garden magazine and I thought they made great decorations for all the items on the table. I wanted clear bottles for the children to drink from but didn't have time to order them online, Hallmark also wanted to charge me €8.99 for four plastic bottles - no way was that happening, so I popped into Tesco, got some smoothies, washed out the bottles when the drinks were done and voila - perfect little drinking bottles, they only cost me €2 too! I also decorated the bottles with some In the Night Garden stickers, I also added some to the other drink bottles we had. The straws were only €1 for a pack of 25 from my local discount shop. As you can, the decor was really cost effective. I didn't want to go to too much expense as we weren't having many people over and at the end of the day I really like how the display turned out, even though it cost very little. A lot of people had to cancel coming to the party, it must be the time of year, but it didn't dampen our spirits and we had a lovely time with those that came. Even though Tyler Lee was a bit cranky - I don't think he likes getting older - it was a great day all round. This will probably be Tyler Lee's last party for a couple of years. Jacek and I have been talking about planning something quite special for his next birthday and I'd definitely love to do it for our boy if we can. Overall, my boy loved his In the Night Garden themed tea party and it just goes to show you don't have to spend a lot of money to make the 'wow' factor for your child - my boy couldn't stop saying "wow" when he saw everything, so adorable. Wow so Colourful. He looks like he had great fun. I wouldn't mind having some of that myself. The party is simply adorable! I love all the bright colors and that cake - what child wouldn't fall in love with that beautiful cake? Looks like such a great party and those curls??? Beautiful! What a fun 2nd birthday party!! Holy cow, look at that cake!! You really know how to throw a party! I love all your decorations! Happy Birthday, Tyler Lee! Momma sure did an incredible job at getting everything looking just perfect :) I love that cake, what an incredible job your decorator did! I love your pictures! I pinned for inspiration for my daughter's 2nd birthday party. Wow, look at all that hard work you did! That is great!! I can tell you worked super hard on the cake and decor. The cake looked amazing! I've never been great at cake decorating! Kuddos! What a colorful birthday is right. Love the cake. He must of had such a great day. The pictures are beautiful too! Oh wow Fiona, it looks amazing!!! So colourful. Elliot is sat next to me as I typed this and he was craning his neck over the screen to have a look and he said "wow!". The cake looks brilliant! Wow this is incredible! Everything looks so great. So many colors. My kids would love this. That cake is so awesome! I love love LOVE this ! : the cakes and color are to die for. Not many ideas for little boys so this is perfect. I bookmarked it because I want to redo it for my son! So adorable!! Our little lad is 8 months, lovely to have all this to look forward to! Oh wow, that cake is gorgeous! These decorations are so beautiful. I am glad to hear that everyone had an amazing time. This is just way too cute. That cake and those cupcakes are BEAUTIFUL! Wow! I love them so much! Great cake! So colorful! Happy Bday to Tyler! I love the cake! This looks like such a cute party. My son will be 4 next month, and I'm trying to decide what to do for him this year. Awesome party! You did so great with it! I love this! My boys are huge ITNG fans, we would love to have a little Iggle Piggle party! Great photos. I bet Tyler had fun. Looks like it must have been quite a celebration. Thank you for sharing. That is a really really awesome birthday cake! I bet it received tons of compliments. How adorable is that cake! I love the theme too very unique. What a fun party theme! I love all the details on the cake it looks too good to eat! What a great party set up. Love the cake! So bright and colorful!!! I'm sure Tyler Lee had a wonderful party! Omg I'm just absolutely inlove with this whole party theme!!! And that cake!!!! Omg best cake EVER!! The cake looks really cute and colorful. Kids would definitely love these concept. You most certainly went above and beyond with that cake. He's a lucky little man, and it seems as if he thoroughly enjoyed it all. Such a cute cake, inside and out! Happy Birthday to your little one! That's wonderful! I think that cake is the coolest part. Everything looks so beautiful and amazing. It looks like it was a wonderful birthday. You definitely out-did yourself. The cake is surreal! What a cheerful party! I love all the colors and that cake is adorable!!! Look at all those cute goodies. Love the cake and the cupcakes. They're so adorable. I'll bet it was such a happy birthday for Tyler. Wow, what a fun and colorful theme for a party. That cake is out of this world. I am not familiar with Night Garden, but everything looks so cute and colorful. I think it must be really fun to eat a rainbow-colored cake. It looks like you guys had a great birthday party! That cake is super adorable! I love it! Oh my everything is so cute and I love it all. What a fun kids birthday, my son is turning 3 on March 9th so I needed this idea. That cake is amazing! I love all your decorations! Brilliant colors! what a lovely party! I love the cake. Happy Birthday to Tyler Lee! What a lovely cake and all those characters. So cute. Nice job mom! OMG - this is cuteness overload. Glad you have all those pics since Tyler Lee won't remember this yet. Love a great tea party. Wow! What a teaparty! He looks like he had a great birthday. Love the colors. That is such a cute idea for a birthday party. I have never thought of throwing a tea party for any of my munchkins. Such a great idea.